One of my dearest friends is set to get hitched to her dream of a boyfriend and I devised this recipe to commemorate their happiness. Risotto is a versatile food: elegant enough to accompany a momentous announcement but comforting enough to be shared among friends. This recipe is endlessly customizable. Substitute ingredients based on availability and preference. 1. Add diced prosciutto to a well oiled pan. Cook until crisp and fat is rendered, then set aside. 2. To the same pan, add the shallots, garlic and pepper, taking care not to let the garlic burn. Salt and pepper lightly. 3. Add a little more olive oil to the pan once all the vegetables are tender, then add risotto and stir. 4. Once the risotto is lightly toasted, ladle enough stock into the pot to cover all ingredients. Stir every minute or so, until all the liquid is totally incorporated. 5. Repeat this process until risotto is tender. Season to taste. 6. When the risotto is done, remove from heat. Quickly stir in arugula to wilt, then top off with a tablespoon or two of butter and ricotta. 7. Garnish with cooked prosciutto and ogle. Then eat and enjoy! Risotto must be stirred frequently. 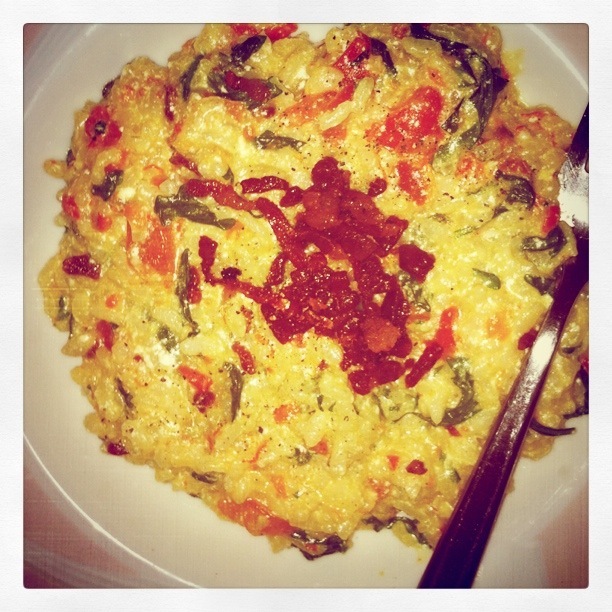 Risotto should spread on the plate when served (thank you, Tom Collichio). Risotto should the star of the show and not overwhelmed by the other ingredients.